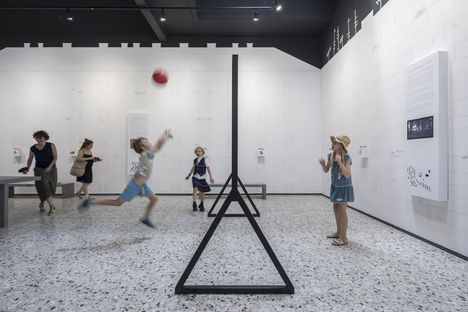 Often our childhood memories lie dormant in the back of our brains, but you just need to step into the Romanian Pavilion in the Giardini of the Biennale and we challenge anyone not to recapture something from their memory. This effect is expressed in the exhibition title, MNEMONICS, Collective Memories Define Our Territories, curated by Romeo Cuc, Mihai Gheorghe, Irina Petra Gudană, Roxana Pop, Raluca Sabău, and Vlad Tomei, a young team with an average age of 27. Mnemonics refers to the ancient art of memory - ars memoriae - based on a connection between thought and a visual support full of meaning, making it impossible to forget. Here, these unforgettable things are the free spaces between the apartment buildings constructed in the second half of the 20th century in Romania on the back of its rapid industrialisation and urbanisation. This spawned a kind of interstitial space in the urban fabric, soon take over by the people living in the vicinity, since it was not the target of urban development projects. In the collective memory of the generations of recent decades, these free spaces, which nobody claimed outright, but which in reality belonged to everyone, form a common image. A freespace among the apartment buildings whose universal symbol is the image of children playing outdoors under the distant supervision of their parents and grandparents, freely creating their invisible worlds in the empty spaces. Hence the research of these creative artists into the social and cultural functions of free public space in Romanian cities, in the sense of freedom of movement and imagination, the freedom to remember our childhood and to reconnect its playful spirit to adulthood. Not everyone knows that many of Romania's most famous athletes gained their first experience in these very places that are so different from the colourful, sleek playgrounds designed for children today, robbing them of much of their innate creativity. To grasp the curatorial concept, you only have to look at the Pavilion setup, drop your bag and jump on the swing despite your age, obviously only after you've hopped your way down the hopscotch court, drawn at the entrance. The installation uses specific objects from these spaces between the apartment buildings, from the metal bar used to beat the carpets as the goal post for football or volleyball, the metal roundabout, the concrete swing or ping-pong tables, which make the perfect shelter when it rains. In many cases, however, these were just a simple backdrop for the multitude of outdoor games that the children invented. Many of them came home from school on their own because their parents were at work. These latchkey kids wore the keys to their homes on a string around their necks, a very common habit in other north and eastern European countries too because it was considered the best way to make sure the children didn't lose them while they were playing. This key hanging on a piece of string is the actual symbol of the Romanian Pavilion and comes with a delightful and attentive graphic design. 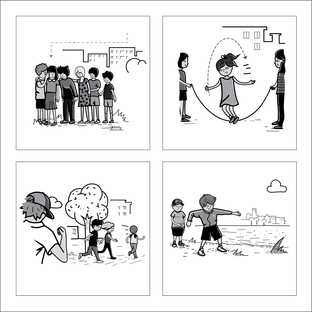 The MNEMONICS catalogue is great fun too because it contains a collection of cards of the “simple” games explained in the pavilion itself as well as a series of stories about these truly generous freespaces. And the photos taken by Laurian Ghinitou during the preview show the countless games that can be created in a shared and free freespace that we urge you to play in person. A second Romanian exhibition, at the new gallery of the Romanian Institute of Culture and Humanistic Research (RICHR), presents the hallway of the apartment building as a transition from public to private space.